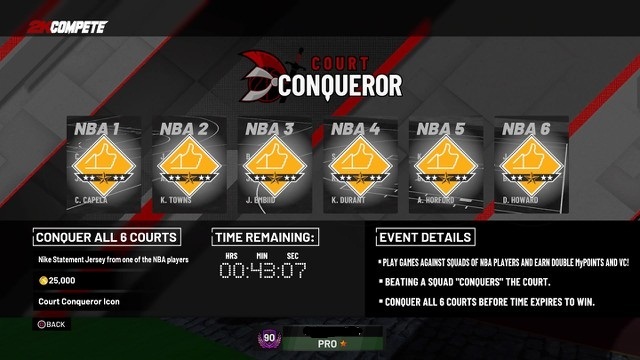 Court Conqueror is one of the events in NBA 2K19 and you can earn double VC when you had beat all NBA squads in the park. NBA 2K19 court conqueror will have your team up with other MyPlayers to take on AI players from various NBA teams. The park will be outfitted to look like a castle as well, the goal is to takeover the NBA star squads and you will earn some pretty large award. Here Gamepretty will guide you the 5 tips to win court conqueror in NBA 2K19. Most players failed because of the knockdown shooters that they can’t do their style of gameplay. So if you have 3 shooting guards. Just launch those threes. If you have more big men, try to get down on dirty in the paint. Try to handle the ball more and there is typically more space to spin and fake pass and euro-step your way to glory in Court Conqueror. Don’t be afraid to turn the ball over. This is not a real game and the 3-points worth 2 and 2-pointers worth 1. Which mean that you can try more threes when your player is open. You can make this out logically. 3’s are 2/3 of a point in a typical game . but now they are worth 1/2. If you have a big guy, you need abuse your opponent in the paint by back them down and use your knowledge from the previous rule of finding mismatches and simply backing them down. Don’t jump in the match. Because if you jump and are wrong. You will take yourself completely out of the play and allow for easy baskets. The key to defense is try to make the them contested shots without being baited into jumping. After you have had finished the court conqueror event. You will get your rewards in about 20 minutes. Hope you can win the court conqueror finally.